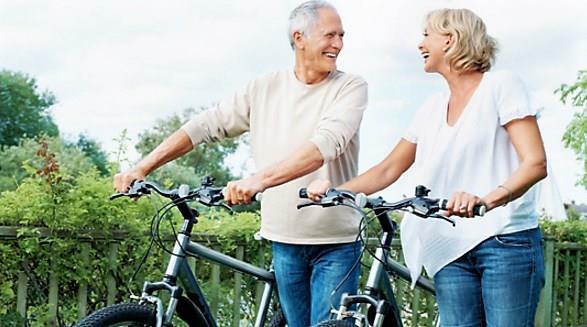 Just because you are getting a little older, it doesn’t mean that you need to stop exercising and become inactive. Maintaining your fitness levels and remaining active is beneficial to your health and vitality. Here are some tips to help you plan your exercise regime. Before getting started if you have a pre-existing condition ask your doctor if there are any exercises that you need to avoid. If it has been a little while since you last exercised you may want to slowly build up your exercise routine. Begin with two lots of ten minute exercises a day, or a couple of exercise classes a week and build up from that starting point. To avoid any injuries make sure that you warm up and cool down properly. Remember to drink plenty of water during and after exercise. Find exercises that you enjoy. Plan and commit to an exercise schedule for at least 3-4 weeks it will then become a part of your daily routine. It can help if you have a friend or partner to exercise with, you can then make sure that you stick to your routine and encourage each other. Find exercises that you enjoy and mix up your routine making sure that it is both inspiring and interesting! Here are some fitness activities for you to consider. Cardio endurance exercise, this will get your heart pumping! It includes activities such as walking, stair climbing, swimming, hiking, rowing, tennis and dancing. Helping to decrease feelings of fatigue and shortness of breath, so that you can keep up with the grand kids! Strength and power training that works to build up your muscles, Pilates exercise classes, free weights, body weights or elastic bands are ideal for this. Power training is strength training done at a faster speed, building up your bone mass and muscles as well as improving your balance. This will help you to get the most out of your sightseeing when you are travelling the world! As we age it is important to maintain our flexibility and balance, this can be achieved through stationary and moving stretches, keeping your muscles and joints agile, making you less prone to injury. A Pilates exercise routine is a fabulous way to achieve this, then you will always be able to show off your best moves on the dance floor! If you have had an injury in the past it is important to make sure that your fitness routine is tailored to your injury. Our Physios at any of our locations will be able to help you to achieve this.